an occasional 4th of july tradition at casa mouse is listening to norman corwin's amazing radio play our lady of the freedoms, and some of her friends -f and I happened to catch it on our local npr station friday evening. the program first aired in 1997. although it centers around the statue of liberty it's so much more than just that story - that's not to say that that story isn't enough. if you haven't listened to the program, I hope you will run across it - there are ways to download the program or order cassettes, but for some reason I can't seem to find an easy to access podcast. you may not recognize the name norman corwin, but unless you have been living under a rock for the last 75 years, you have most certainly run across some of his work if you live in the united states. mr. corwin is a legendary radio playwright who has created inspiring, educational and entertaining radio programs since the 1930s. corwin, who incidently turned 100 in may, has been called the poet laureate of the radio. in 2005, corwin participated in the radio program this I believe, his essay, which you can read or listen to (5 minutes) by clicking here, gives a glimpse of his worldview, I believe it offers a key to understanding his oeuvre and his rich body of work - and, I might add, some mighty good mouse medicine; after all, the essay is entitled "can good be as communicable as evil?" 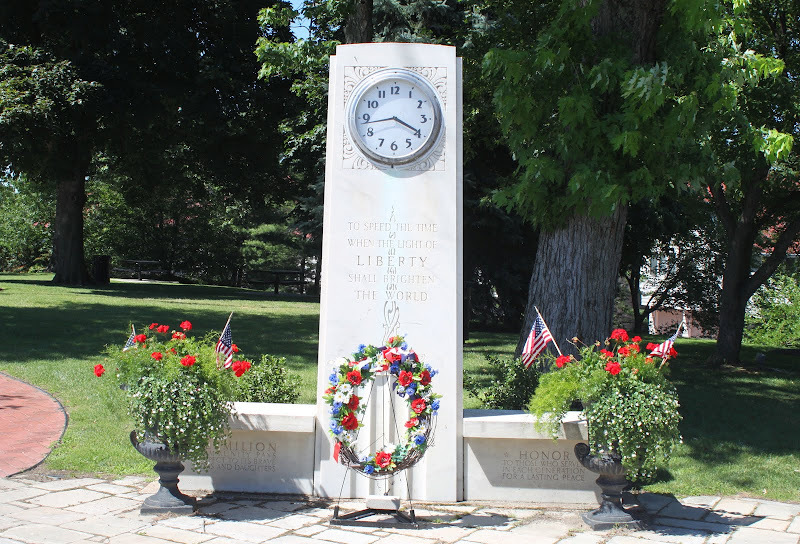 photo: monument in vermilion, ohio - a charming little lakeside town not too far from where we live. f and visited the town for the first time yesterday afternoon I can't wait to return. there is a museum that looks worthy of a wander, a czech resturant that em says he's heard great reviews of, not to mention, the an annual festival called the festival of the fish - the name alone makes me want to check it out! unfortunately we just missed the festival. Thanks for popping by the other day and happy 4th of July. I cannot believe it is July, can you? This is a great post; I loved your beach photo. The first of the bunch brings Arlington and my parents who are there, to mind. Thanks, Kimy for bringing this to my attention. No, the name Norman Corwin didn't ring a bell, but you are correct...we probably all have known OF him. Thanks for the link...going to check it out! Hope you're enjoying the holiday weekend.